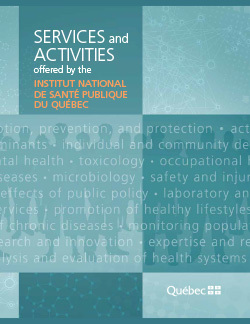 The Institut national de santé publique du Québec (INSPQ) which is an expertise and reference public health institute, was created in 1998 following the adoption of its act of incorporation (R.S.Q., chapter I-13.1.1). Its experts come from fields as distinct as applied science, health sciences, social sciences and humanities and work with the health care network to develop and pool public health knowledge and skills. The Institute seeks to be Québec's province-wide public health expertise and reference centre. Our goal is to advance knowledge and propose cross-sectoral strategies and endeavours that will improve the state of health and well-being of Québecers.